Our chapter's quilt was featured in Surface Design Magazine. Here's a nice write up about a past show at Clover's Fine Art Gallery in Downtown Brooklyn. That's the show at Clover's Fine Art Gallery, “I Am Woman,” which runs through May 18. Our especial favorite among the artists was Laura James. Somebody already bought a witty work of hers called “My Lady,” where women in a well-appointed high-rise apartment with an eye-popping view (which is too naughty to explain in print) have drinks and cheat at cards while slightly surreal things go on around them. She is also showing guardian angels worthy of adoration and beguiling paintings of the Jamaican countryside that she created to illustrate a children's book. Other artists in the powerful show are Mona C. Haigler, Roni Sherman Ramos, Calice Fyffe and Carol Montgomery. The Boerum Hill gallery, which focuses on Caribbean art and artists, belongs to attorney Clover Barrett. Hours: Tuesday-Friday 8 a.m.-6 p.m. (the gallery has a café that opens early on weekdays so people can buy morning coffee), Saturday-Sunday 11 a.m. -6 p.m. Here's a write up in the New York Times in July of 2009. Art Bazaar was started by a Chelsea gallery owner, Michael Lyons Weir (Lyons Weir Gallery). 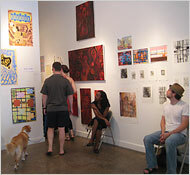 Art Bazaar offered artists an exhibition on a first-come, first-served basis on weekends during the summer months. At the end of the summer, the artist who sold the most work had the opportunity to have their own show. I took part in the first show. New York's Next Top Artist?